I’m not sure at what point QRSS came into sharp focus for me, but it represents quite a logical step given my interest in QRP. A couple of years ago, I remember finding out about illegal unlicensed low power HF beacons (as opposed to the legal unlicensed Hifer beacons) and even hearing a few. I seem to remember that there was one somewhere around 4096 KHz located out in the Southern California desert (probably solar-powered) that I could hear in San Francisco. Hearing the weak dashes on my radio that were coming from a small transmitter out in the desert somewhere really held my attention. I wanted to put one on the air myself but a) they were illegal and I hold an amateur license and b) as much as I liked the idea of hiking out to a remote area, hiding a transmitter and then being able to listen to it at home and from other locations, leaving an unmanned transmitter, even a QRP one, transmitting for long periods of time didn’t seem very responsible – especially as I didn’t know who else was using that segment of the spectrum. At that time I didn’t know about the so-called unlicensed Hifer beacons operating in the 13553 – 13567 KHz band or I might have put one of those on the air. Amateur Radio to the rescue. We really are lucky to have so many RF spectrum privileges. If necessary, we can use up to 1500 watts of power on many bands, and we have no antenna limits. So if you have the resources and the time, you could squirt 1.5KW of power into a 5 element beam on 80M. Sometimes, that kind of power is necessary to get the job done. Try asking the SSB EME folk if they’re happy to be able to use high power into any antenna they like. Some (for which read many) things you can’t do under Part 15 regulations, and EME is one of them :-). The 30M QRSS Transmitter kit ordered I sat back and figured that while waiting for the kit to arrive from the UK, it might be useful if I had an antenna for 30M. Since moving to my current place, I’ve had a length of wire taped to my 32 foot fiberglass mast tuned against a “ground” consisting of a cold water pipe which I have recently discovered might not be connected to ground very well, if at all. It works appallingly. For all my adult life, I have always used either good antennas in compromised locations, or just plain awful antennas, not to mention the excruciatingly ghastly antennas deployed in equally frightful spots. 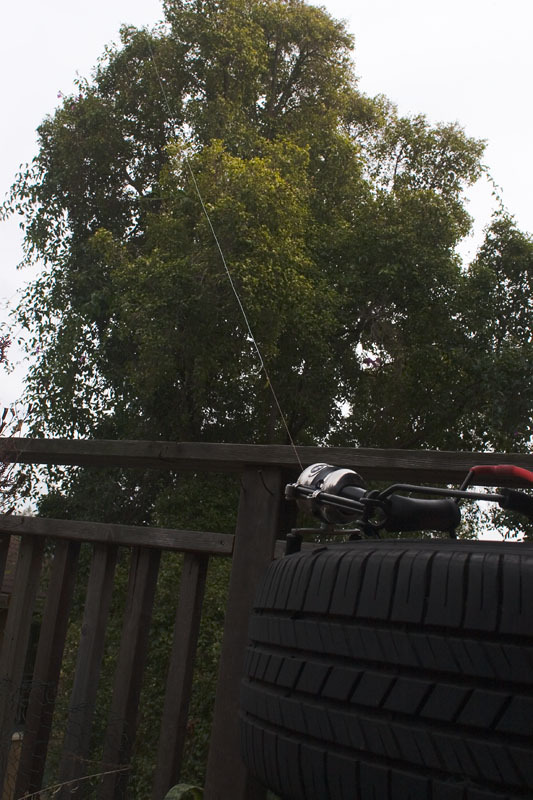 It was time for salvation in the form of a simple yet effective antenna erected high and in the clear, and luckily my current QTH offers some hope in that regard. One look at this and your childhood will flash before your eyes. It’s the EZ-Hang and it’s an adult excuse for picking up a slingshot again. 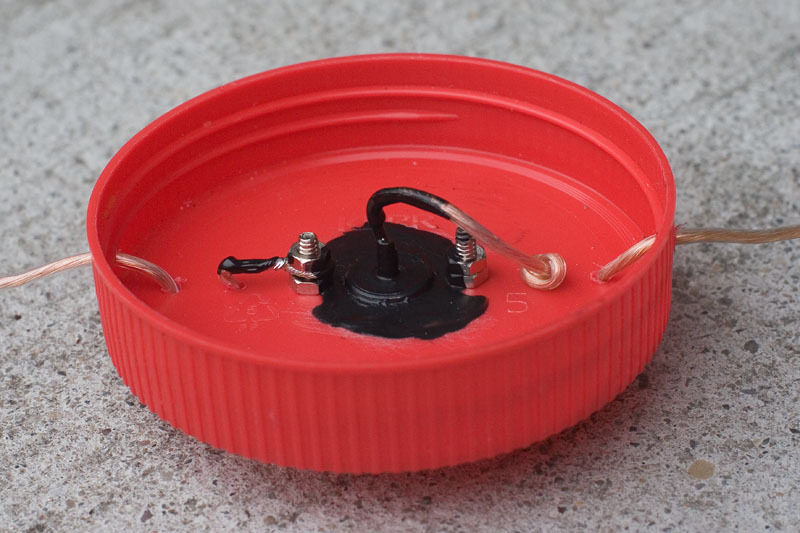 I had wanted to use 1 oz lead fishing sinkers for the weight but I live in a built-up urban area and there are too many car-roofs, windows, and people around to risk it. The mini tennis ball came in a pack of 4 from a pet shop and will shoot high enough for a 40 foot tree. Added to that, it is brightly colored and easy to spot once it has fallen back down to the ground. Many other ways exist to get a line up into a tree. You can use a regular slingshot and fishing line on a separate spool, some people use a bow and arrow, or you can fill a small pouch with sand or stones and toss it up into the tree. Your call, but whichever way you do it, it’s fun being outside and stringing antennas up. The easy way to do this is to shoot your projectile over the tree and not through it. 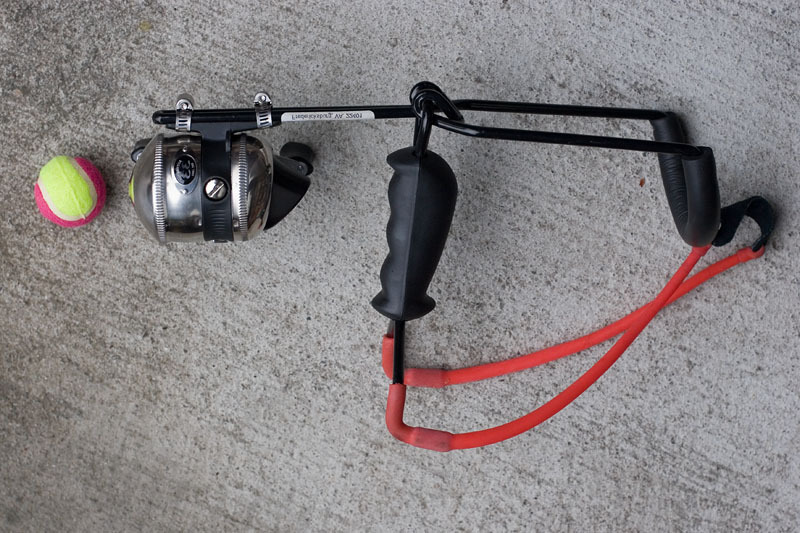 I use very lightweight 4lb test monofilament in the reel. Once the tennis ball has fallen the other side of the tree, I cut the ball off, tie heavier monofilament to it (40lb test) and reel that back through the tree. 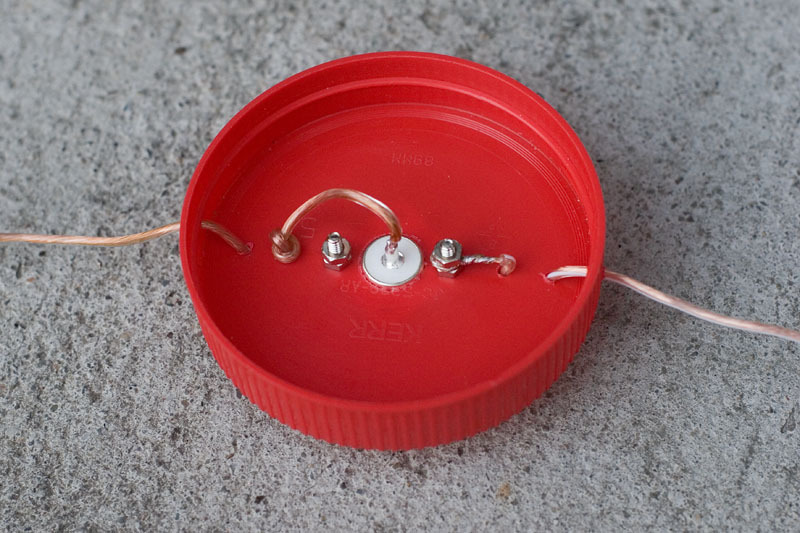 The 40lb test monofilament ties directly to the antenna wire – no insulators needed. It’s also hard for neighbors to see and dislike. Heck, if you use thin stranded antenna wire with a light or white insulated coating, it’ll be tough to spot from the ground when viewing it against the sky. I could have soldered the coax directly to the dipole elements, but had just bought a new length of mini RG-8X with PL259's fitted on each end and wanted to preserve them. 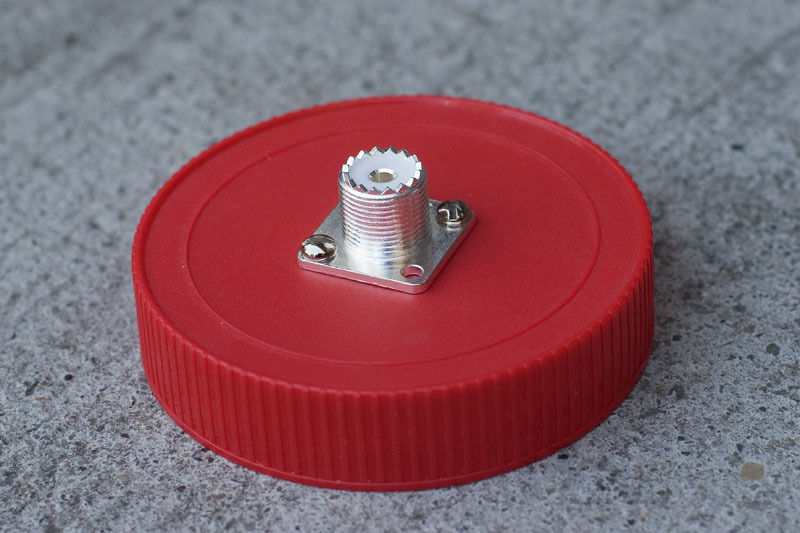 At the top of the peanut butter lid (I mean dipole center insulator) is the string that attaches to the eyelet on the top of the fiberglass mast. Pulling the heavier 40lb test line back through the tree. If you look really closely, just above the balcony railing you can see the knot joining the lighter line and the heavier line. 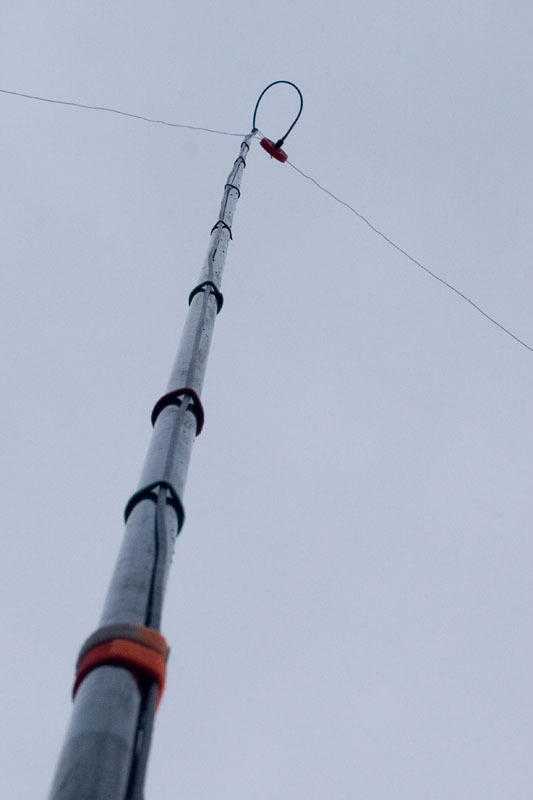 A view of the mast from near the bottom, showing the mini RG-8X attached to the mast with velcro straps, and the center insulator at the top. I wanted the center frequency of the dipole to be 10.125, the exact middle of the band. It’s a narrow band so there would be no problem covering all of it at low SWR. – meaning the each dipole leg should be 23.37 feet, or about 23 feet 4.5 inches. I didn’t cut the wires – just folded them over to make the new length, elevated the center of the dipole back up to it’s full height and measured the resonant frequency again. It wasn’t perfect at 10.17MHz, but close enough. The dipole showed an SWR of 1.3:1 or below across the whole band, which is good enough. At 10.1405, the center of the QRSS segment, the SWR is 1.1:1, which makes me very happy. 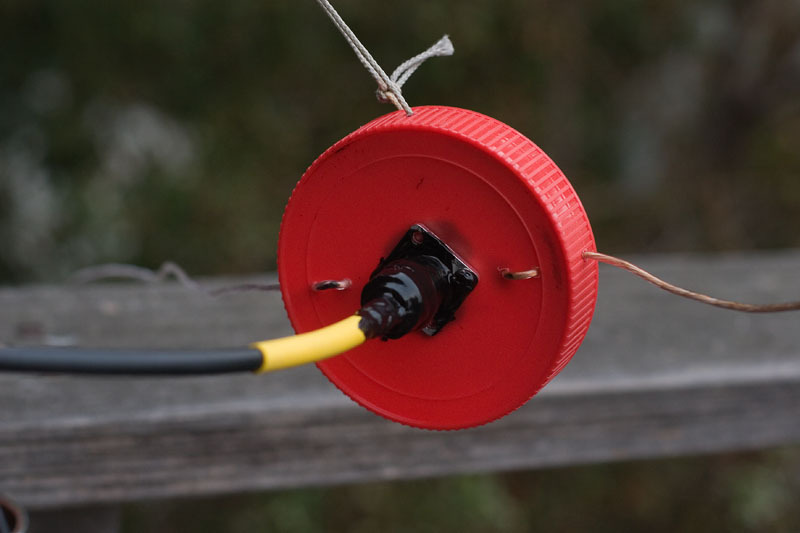 Using this method makes pruning antenna lengths faster, and cuts the trial and error. You may have noticed that I haven’t used a balun. The reason is the extra weight it would add to the top of the fiberglass mast, which is pretty thin and whippy at the top. If you’re using a more sturdy type of support, by all means use a balun. It will reduce any RF currents flowing on the outer shield of the coax, which can only be a good thing. So how does it work? Well, with previous antenna installations at this and my previous QTH just down the road, I had noticed that other amateurs in my general area seemed to be getting many more WSPR spots than me, and when they did hear stations that I heard, they were receiving much better signals from them. This was not just happening with the odd station here and there; it was a very noticeable overall trend. On plugging the new dipole into the back of the FT-817 (which is an inverted vee dipole with the center at 47 feet and the ends at about 35 feet) immediately 30 meters sounded more alive than I had heard it before. A few hours on WSPR and I was getting a lot more spots than before – about the same number as other amateurs in the area and with similar signal reports. With my first 2 minute TX period, I was spotted by 13 separate stations. This had not happened to me before! It’s one thing to know how important it is to have an antenna elevated and in the clear, but another thing to actually experience it. At 47 feet, the center of my 30M dipole is about half a wavelength above ground- a good thing. You should strive for at least a quarter wavelength in order to get something approaching the correct radiation pattern for your antenna. Don’t worry if you can’t mount the entire dipole horizontally. The point of maximum current is at the center of the dipole, so this is where the most radiation occurs from. For this reason, getting the center of the dipole up high is more important than getting the ends high. Posted in Amateur Radio, Ham Radio, QRSS.Tagged 30M dipole, EZ-Hang, Hifer beacons, how to make a dipole, inverted vee, making a dipole, QRP Labs QRSS Transmitter, QRSS, unlicensed hf beacons. Good going, Dave! It’s tough to beat a dipole up high and in the clear. I’m not putting my QRSS beacon on the air that much right now – after operating it a few times, I realized that what is needed are more “grabbers” for all those beacons. So I installed Argo, captured many beacons and then learned about ArgoUpload (http://www.dxzone.com/cgi-bin/dir/jump2.cgi?ID=14281) to automatically transfer my screenshots to my webserver so that beacon operators could see their sigs as received here. I’m not an expert at ftp/’puters, etc but I’m not a dummy either. For the life of me, I couldn’t get the uploader to work and gave up after 2 or 3 sessions of trying every combination of possibilities. I may have a fresh go at it again, perhaps with an email to its author for a little tech assist. I’ll be anxious to hear about your results once you get that QRSS tx going. Good idea about the grabber John. One of the QRSS stations I e-mailed a report to told me that he doesn’t get that many reports from the west coast. I don’t have my own domain, so don’t think that a grabber is in the works for me but will, for the time being at least, make a point of sending reports to every new station I see. I’m currently looking out for WA5DJJ’s 125µW QRSS 80 signal. He’s operating with 80 second dits and 240 second dahs between 10,139,970 and 10,139,980. You have to set your software really slow and make sure to look just under the edge of the normal 10,140,000 lower QRSS segment point. You would stand a good chance of hearing him I think John. It’s been a long, long time since I’ve had an HF antenna that can hear properly, and it feels good!